Thank you for using Visa Information Services. 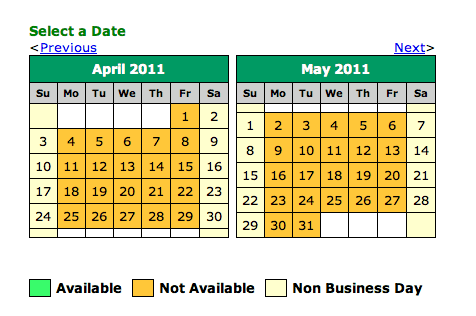 The schedule availability is full for the next 2-4 weeks. The U.S. Embassy will gradually open more dates/time as soon as possible. Please check our web application frequently. Live call PIN or Web PIN are accessing the same schedule availability system. Thank you for using the Visa Information Service. We apologize for any difficulties you may have experienced. There is currently a high demand for visa interview appointments. Appointment availability changes regularly as applicants schedule and cancel appointments. In addition, appointments will become available as the U.S. Embassy and the U.S. Consulate General continue to add more appointments for the future. Please check the site again. เมล์ตอบเรื่อง VISA USA อันที่สาม อันนี้ถามว่าให้ผมไปซื้อ telephone pin ใหม่แทนมั้ย ? The Live PIN and Web PIN are same schedule interview appointment. Please check the site again every day.